Kids love birds. They're fascinated by birds' colorful feathers, their sounds and their funny antics. So is it any wonder most kids eventually want their very own bird for a pet? Of course, birds are not the greatest pets for kids, generally speaking. Kids can be grabby and impatient. Birds can't tolerate rough handling. Some large parrots such as cockatoos and macaws can actually pose a danger to small hands and faces. But there are exceptions to every rule. If your child shows a serious interest in birds and is gentle with animals, a small feathered friend might make the perfect pet. Small birds need just as much care and attention as big parrots. A good diet and regular vet checkups go a long way toward keeping small birds healthy. Even small birds can be too noisy for some people. If steady chatter or occasional screaming is unacceptable, a bird might not be the right pet for your household. Always monitor your child's interactions with a new pet. Make sure kids understand that most birds need lots of time to warm up to unfamiliar humans, but if treated kindly, they can become wonderful friends. Shop around. Prices vary widely among breeders, sometimes by several hundred dollars. Better yet, consider adopting from your local animal shelter or bird sanctuary. Many bird clubs also have tame birds available for adoption. Birds do not need to be young and hand-raised to make good pets. Second-hand adult birds can be just as good. Among small birds the Quaker is a medium size at about 12 inches long including tail. These fussy, funny little birds are the best talkers, able to speak clearly in high squeaky voices. In general, Quakers are a bit nippy and bossy, but not always: "He is not noisy, does not scream, does not bite, and is not territorial. He is very cuddly and sweet and lets strangers pet him," says one owner. A normal green Quaker costs a relatively reasonable $150; rarer color mutations are more. Quakers are banned in some states because they're considered nuisance birds. Pets that have escaped or been released by their owners are capable of establishing feral colonies that build large nests in suburban neighborhoods. Lovebirds are another nice choice for older kids. 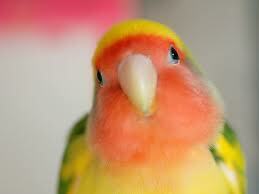 These little green birds with pink cheeks are inexpensive at under $100. They're cheerful and active, fond of taking baths, and though small can live up to 30 years. 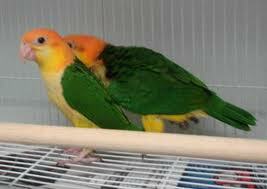 Lovebirds can be somewhat temperamental but once tamed enjoy being petted and cuddled by their favorite human. Frequent handling keeps them lovable. Lovebirds are poor talkers but some mimic noises such as microwave beeps. This clownish, acrobatic little parrot is highly entertaining. Caiques like to play hard, wrestling objects and hopping like windup toys. Many owners keep two or more for companionship, and "twice the fun," as one fan put it. They hang upside down "like bats, beak wrestling. They love toys with bells, leather knots to undo." Caiques are famous for "hair surfing" and burrowing in clothes. They are long-lived - up to 30 years - but not great talkers. The caique has two flaws: its pugnaciousness toward other animals - it will attack other birds, dogs and cats - and its expensiveness. Both the white-bellied and black-capped variety costs between $750 and $1,000. The conure is sweet, lovable and fun to watch, making it a great first bird. Conures are big dancers, lifting their feet and bobbing their heads to music, and often play with toys on their backs or while hanging from one foot. They have a deserved reputation for screeching. 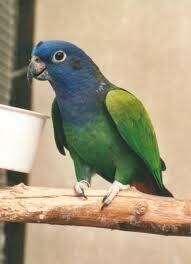 However, green-cheek and blue-crown conures are relatively quiet compared with Jendays, Nandays and other mutations. The sun conure is arguably the most beautiful, with flaming red and yellow feathers instead of green but can be three times as expensive, costing up to $600. A pet canary or finch is a great way to introduce birds to kids who are too young to handle a pet. Unlike parrots, finches and canaries don't particularly desire human contact. However, they do like feathered friends, so buy them in pairs, then sit back and enjoy their beautiful plumage and antics. Canaries have stunning singing voices; finches emit a distinctive "beep beep" call as they hop from perch to perch. Lifespans are short but cost is moderate at between $100 and $200. The sweet-tempered pionus rarely bites, making it an ideal parrot for kids. It's generally quiet, and less likely to bond exclusively with one person, a common problem with parrots. Pionus owner Ellen Coltrane loves the bird's "musky fruit-like smell...very appealing." About the size of a pigeon, the pionus is the largest parrot on our list so it will need a bigger cage. It can live up to 40 years, remaining a member of the family for a long time. Unfortunately, pionuses are mainly available through breeders and are extremely expensive, going for up to $1,000. 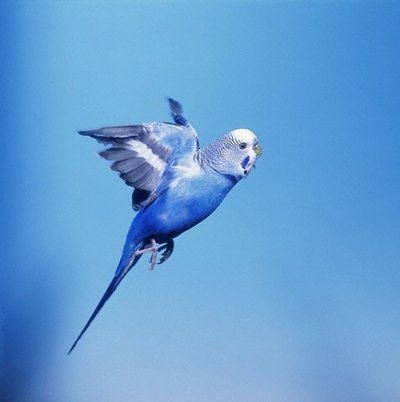 The budgie (parakeet) was the first bird in the U.S. to achieve widespread popularity as a pet. Friendly and inexpensive, they're still a big favorite with kids and adults alike. "Budgies are little clowns," says one owner. "They're always on the go, chattering and playing, or rummaging through the food bowl. They make noise all the time! But it's a playful and pleasant noise." Budgies are easy to keep and available in a rainbow of colors. They tame easily and remain affectionate. With adult supervision, preschoolers can be taught to care for a budgie. The budgie's only serious drawback is its woefully short lifespan. It's been estimated that 90 percent of all budgies eventually develop tumors; many die within a few years, much too soon for those who love them. These super-tiny parrots - some measure just 3 1/2 inches from beak to tail - are even smaller than parakeets but have big personalities. 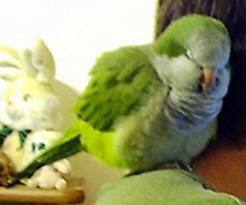 One owner calls her parrotlets "the pitbulls of parrotdom." Parrotlets are playful and a tad bossy. 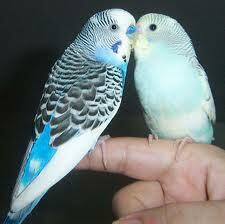 However, they're quieter than budgies and live much longer - for up to 30 years. 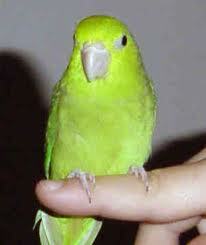 Still fairly new to the pet trade, parrotlets are rarely sold in pet stores. 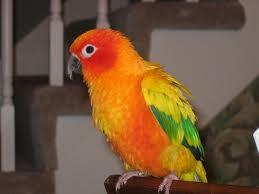 However, more breeders are beginning to offer these budgie alternatives for about the same price. 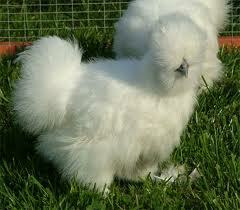 Chickens are great pet birds for families with yards, and the bantam is the perfect size for kids. Bantams are small, good-natured chickens with silky, colorful feathers. Great fun is to be had watching chickens scratch for food, holding and petting them and collecting their eggs. Add a rooster and kids can experience the excitement of baby chicks. Bantams are sturdy enough to withstand kids' rough handling while never posing the problem of nipping. And who can resist the friendly "buc, buc, buc" of a content hen? Our number-one kid-friendly bird is an excellent balance of size, personality and longevity. Compared with most parrots, cockatiels are docile and even-tempered, slow to bite. Like its cousin, the cockatoo, the cockatiel has crest feathers that reflect its mood - flat against the head indicates calm and raised means fear or interest. 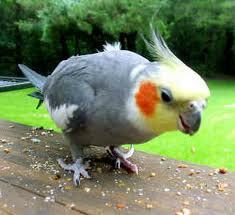 Though not much of a talker, the cockatiel has a pleasing, musical voice for a parrot (unless shrieking for attention). Cockatiels are not athletes like budgies and caiques, but they enjoy exploring their surroundings, shredding paper and courting their mirrors. Most cockatiels prefer not to be groped, but once tamed they love head scratches and can be very devoted to their people, happy to shoulder sit for hours. Cockatiels live for up to 20 to 30 years with good care and are modestly priced at around $100. Also, most bird sanctuaries have cockatiels for adoption.